Sophie Lamond continued her passion for environmental research with a PhD program at the University of Melbourne. "Since graduating from the OEP program I have go on to expand my research interests through a PhD in the Food Policy Research Group exploring how universities can transform their food environments for a fairer, more sustainable future. 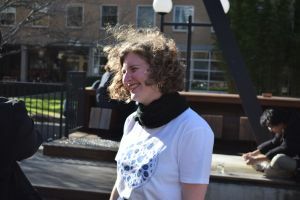 While I was doing my Masters I founded the Fair Food Challenge – last year we ran a series of workshops and participated in over 40 events and diverted 6, 240 pieces of single use plastic from university events by providing reusable serving ware. In 2017 I was honoured to receive the student award of excellence in the Australasia Green Gown Awards for my work with university sustainability."